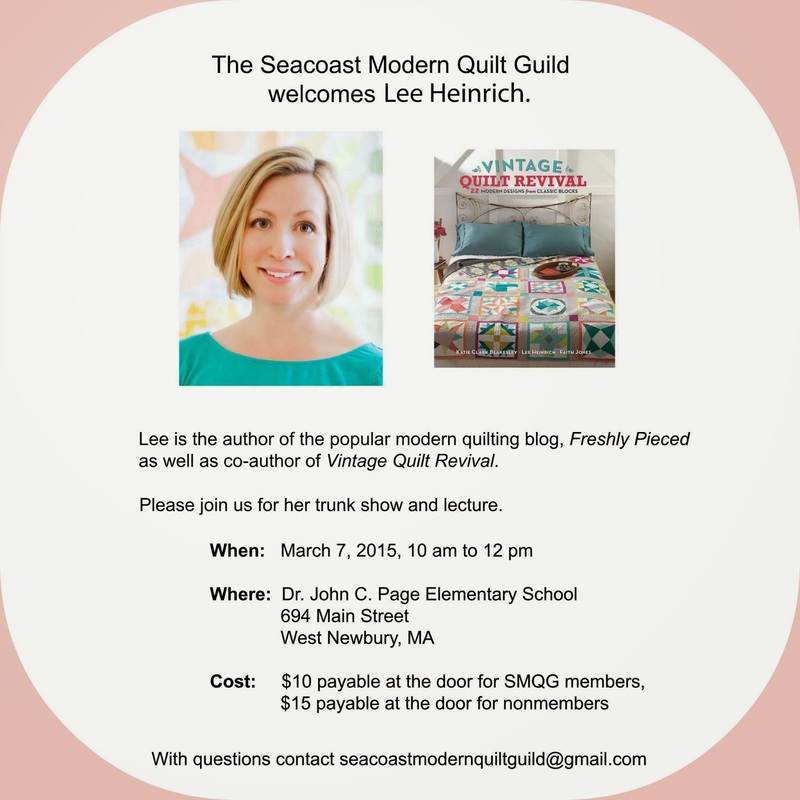 March meeting reminder: Lee Heinrich talk and trunk show! Paula is currently coordinating snacks and drinks via email. Please see the thread and respond if you are able to help! As a reminder, we will NOT be holding show and tell or conducting regular business at this meeting. Please save all your show and tell projects for April. Kali will be collecting pillowcases to be donated to the women's shelter with our charity quilt. Please watch for an email with details from her--but I know many of you have pillowcases sewn and ready to donate already! If you have time this weekend and next week, please consider making a few. We will be giving away some really great door prizes at this event. (As if you needed further motivation to come!) I am excited to see you all there! First off, taking advantage of the time without last year's president and this year's president in attendance, we discussed a way to thank outgoing presidents for their dedication and hard work for the guild. 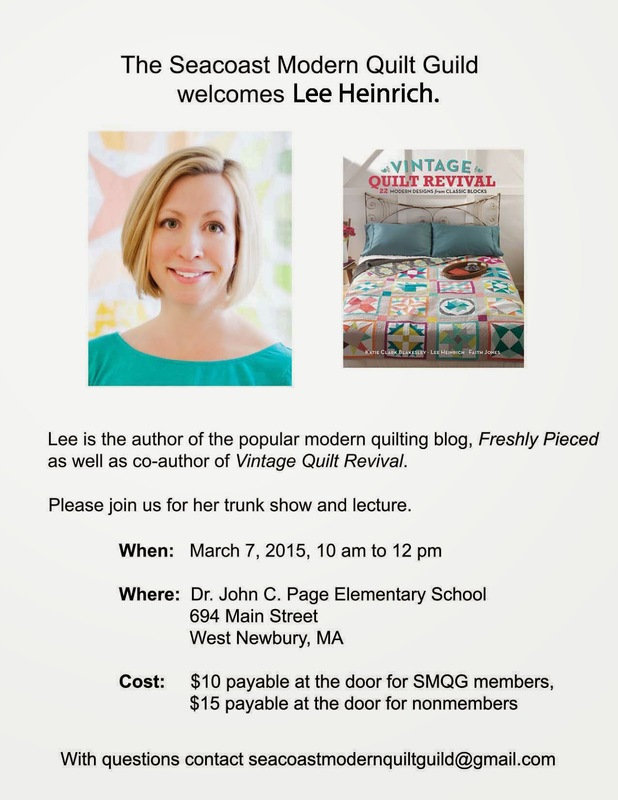 Amy was recently visiting the Merrimack Valley Quilters and suggested their method. The president chooses a block, makes a sample and writes up directions for the block including specifics about the size, fabric, color palette, etc. The guild members make the blocks and turn them in to the VP who gifts them to the president at the last meeting of the year. After some discussion, the group agreed to adopt this policy. We would like Peg to think about what she would like for her blocks and provide us with the information at the March meeting so that we can get a move on them! Laura, you have till the June meeting! MQG Membership cards were distributed. Kali has agreed to be Chair of Charity Projects for the year. She mentioned being interested in wheelchair quilts which are roughly the same size as baby quilts but allow for more sophisticated design. We were reminded that Lee Heinrich will be visiting for our March meeting. The meeting will be held at the Dr. John C. Page School, 694 Main Street, West Newbury. We will not be allowed into the building until 9:30. Please park at the lower lot which is on the left as you come up the drive. Follow the crosswalks to the building entrance. We hope to have a greeter but basically, you walk through the main doors to a second set of doors. Turn right to head toward the Cafetorium. The entry fee will be cash or check only. Nancy and Sue Ann offered to be quilt holders for Lee. Please feel free to publicize the event but make sure you are using the corrected flier with Lee's name spelled properly. If you need a new copy, email Amy or Laura. Jessica and a helper will collect the money at the door. Amy will send the announcement reminder to the BMQG. The Exhibit Committee reported that we will be working on the raffle quilt at the April meeting. All members should bring sewing machines, neutral thread, a size 90 needle, and scissors. Some cutting mats and rotary cutters, irons and ironing boards, power strips and extension cords will be needed to share. The pattern and fabrics will be provided so just come ready to sew. All other info. can be found in the exhibit committee minutes that were emailed so I won't repeat them here. Amy did mention that we would appreciate it if people would start entering their quilts so we have approximate numbers. Info on how to do that can be found in this post. Judy reported that the Executive Committee has been working on a few issues and will report back to the group when they are better prepared. One is insurance coverage for the guild. Additionally, some changes to the Bylaws are needed. And finally, they mentioned the online chatter regarding a New England MQG event and the need to discuss more about that. Both Jessica and Laura will be attending the Leadership Conference at QuiltCon. If you have any questions you would like them to get answered or any thoughts to pass along, do so soon. Laura would like to encourage all members who are attending to go to the general session. Second payments for the retreat were collected and Laura sent an email this week with information from the Franciscan. Laura sent out a survey about bees and other activities. The vast majority were interested in small member to member swaps where you know who you are sewing for but they do not know who is sewing for them. The second most popular idea was a traditional style monthly bee. Judy asked the someone volunteer to chair this activity by speaking to her or Laura. Laura has a list of members and their social media contacts to distribute soon. Phew, after all that business we turned to show and tell. Allison is working on hand-quilting her broken herringbone quilt. Robin shared her modern take on an Amish quilt mini. Sue Ann showed us these blocks from a quilt made in 1996. She was really ahead of the modern quilting curve! Mary completed this lovely table topper with bias binding. Kali was into bags this month and made 3 drawstring bags from In Color Order as well as a bag from Jessica's workshop. Sarah made this flashy skirt to make sure no one missed her at QuiltCon! She also completed this baby quilt for a cousin. ...and made progress on this diamond mini. ...finishing the quilting on the guild banner. Paula has offered to add hanging pockets. Jessica completed this top for a wedding gift. And Paula made this Love mini largely from a scrap bag from a quilt shop in Acton. Diane shared her mini for The Gathering. Her traditional block was called Returning Birds and this was her modern interpretation. She also made this quilt as part of an online class where she was learning to use a ruler to cut triangles. In case you couldn't guess, this is Nancy. In case there is any confusion, she is both wearing AND holding her name. These blocks were made at an improv letter piecing workshop. Nancy is also making this animal print quilt for her niece. And she finished up her Fancy Fox quilt top in time for show and tell at Laura's request but, then, Nancy said "she's not even here." Sue made this modern interpretation of the Boston Public Gardens. Sorry I cropped you out Sue, but you were talking in the picture. Amy also shared her mini for The Gathering which was an improv take on the Grandmother's Fan block. Following the busy show and tell, Sue provided us with a great presentation about batting complete with samples and a giveaway. I would share more details but my hands where busy feeling batting samples so I didn't have time for notes. Thank you Sue. Our February meeting will be held on Saturday, February 7 from 10 am to 12 pm at the Fremont Public Library in Fremont, NH. We will be holding our regular show and tell, as well as workshopping your Gathering projects at the end of show and tell. If you have a WIP or a sketch or a fabric pull or an idea that you are willing to share for discussion and feedback, please bring it and we will give it extra attention! Sue will be leading a workshop on different types of batting. I have only ever used one type of batting off my big old roll, so I am eager to hear about why I might choose to use different kinds in different situations. I have updated the SMQG Events Calendar link (look at the top of the blog home page) as far out as I know meeting locations. I try to type in the address of the location so that you can click the "map" link and pull up a Google map. I know there was a little bit of discussion about where exactly the Fremont Library is (and I got a little lost going there for the first time myself!) so if you are unsure of where the library is, please click the map and take a look.